Passover is fast approaching, and Jewish families everywhere are breaking out their fine Judaica, particularly the ceremonial Seder Plate, which serves as the symbolic centerpiece for the Passover meal. 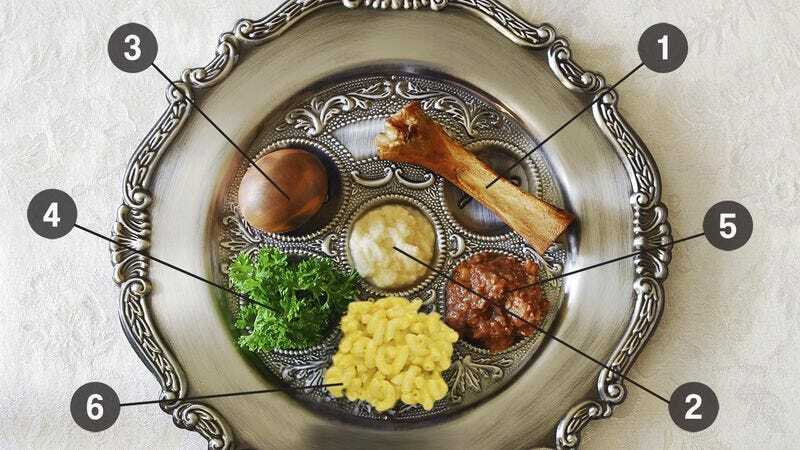 Have you ever wondered what each item symbolizes in the story of Passover? Here is your definitive guide! 5. The Gunk: Every Seder Plate bears a thick hunk of mystery gunk no amount of scrubbing or scouring can seem to dislodge. The gunk is sweet and floral in flavor, but convulses when licked. The great Talmudic scholar Maimonides believed that, were all the gunk to be gathered in Israel, it would be one hell of a huge hunk of sweet, sticky gunk, a belief that Orthodox rabbis maintain to this day. 6. Macaroni And Cheese: A late addition to the Passover tradition, this became a standard feature on Seder Plates in 2009, when eighth-grader Aaron Shenker invited his friend Matt over for Seder, and Matt brought a bowl of macaroni and cheese that his mother made.